To date, I’ve written two novels. The first, “Rice Pudding in a Duvet, a journey home with snacks” was first published in 2014, then re-edited and re-published in 2017. After an unhappy experience with a small publishing house, I then regained my full rights, added illustrations, photographs, made revisions and self-published it in 2018 as “Rice Pudding in a Duvet, second helpings.” My second novel, “Middle Distance” was entirely self-published. More creativity than you could shake a stick at! A mother’s letter to her daughter; the adventures of Alice Bonneville-Beck will take you from campsite to kitchen via the finest hotels, Parisian tenements, the Australian outback, and misty Norwegian mountains. “Rice Pudding in a Duvet, a journey home with snacks” offers nourishment for the soul blended and served with laughter, tears, a twinkle in the eye and a recipe at the end of each chapter. Alice writes from the heart and cooks from memories of her own path to womanhood and her quest to find the way home. Pull up a chair to a moveable feast of warm dinners, laughter, sensuality, and a pinch of sea salt! We go back in time and all over the world as our protagonist, Alice Bonneville-Beck, lovingly entertains and serves her tried and tested recipes. 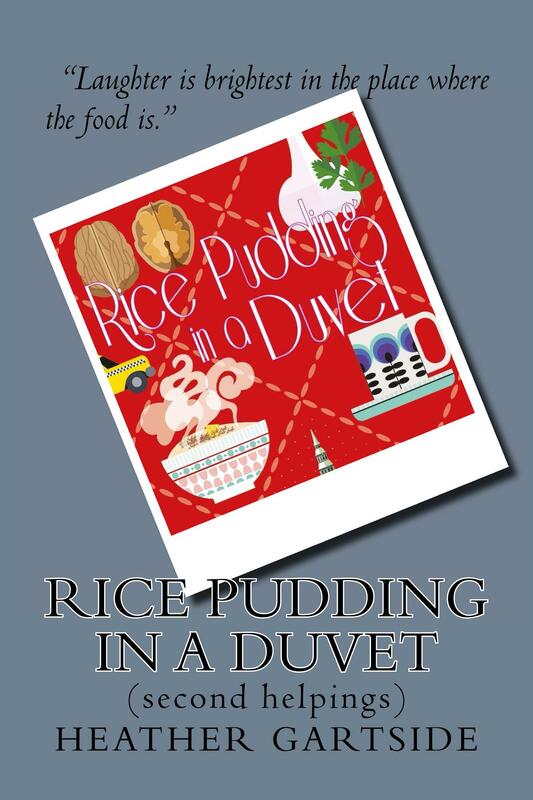 You can find out more about Rice Pudding In A Duvet on Instagram and Facebook where Heather is often found sharing photos of her annoying Jack Russell dog and photos of her beloved book in funny places. Middle Distance -ISBN-9781727023381 was published in November 2018 and is available on Amazon. The photography exhibitions, Out Of The Blue and Middle Distance both reflect and examine these themes. It was an idyllic spring day, unseasonably warm. A blackbird sang with such tenderness, sparrows casually chirped and the deep bass rhythm of a lawnmower plucked repetitively in the middle distance. A recurring slipped stitch in the long tapestry of her life, many years earlier she’d decided to work with whatever materials were to hand to mend the gap. If I thought back to some of her most defining moments, I saw how her periods of sadness evolved into those of creativity – her only respite and the grappling iron with which she hauled herself up every time. An impulse to cast the flawed needlework aside surfaced, to stop the cycle there and then under the hot sun and wake up with new threads. Lying on her cheek in the long grass, she closed her eyes tightly. At first, a flickering orange light appeared, followed by blue clumps of squirming amoeba and slowly the shifting form of a familiar smiling female face began to assemble, then drifting into evaporating clouds – eventually disappeared. Despite her efforts to retrieve the face and the melodic notes, her mind’s eye drifted to a cold winter morning in a sterile grey Vilhelm Hammershøi light once more. She pictured herself stepping into a silver car – ice glazes the windows. She sighs and exhales a misty haze, takes a scraper and begins to shave away the frozen layer on the windscreen. As she works the ice is scraped into small piles, a dark hole emerging through the cold glass. Peering into the blackness she begins to lose all sensation in her body and an irresistible desire washes over her to enter unfathomable depths and become engulfed by the viscous warm darkness, which beckons with a languid grey finger and the swish of long silk skirts. But I know that there were pressing things to do, colours and textures to layer onto the canvas in her mind. The darkness of experience could show through, but it needn’t dominate. Her artful brushstrokes came fast and confidently; the patina of blows seen and not celebrated. She needed to resist the plaintive call of the dark place; to refuse the dry teat that never nourished her and strived to keep her in shadow, and to search for visions to feed her ascending heart. The lead too, that had rested in her soul for months fell heavily away with cowardly ease, as she swept into dark corners and prised it out with all her fury. Her doubts followed swiftly, plummeting into the endless well of irrational fears. They’d sat peevishly biting her fingernails for several months and picking at her every dream.“Get out of me!” She seethed. They hastily covered their flaccid grey nakedness and scurried with greased ruby lips from the partially consumed feasting on her soul. She rose from her collapsed position, a tattoo of wild grasses imprinted on her cheek and the hot sun warming her blood as it surged through her body.